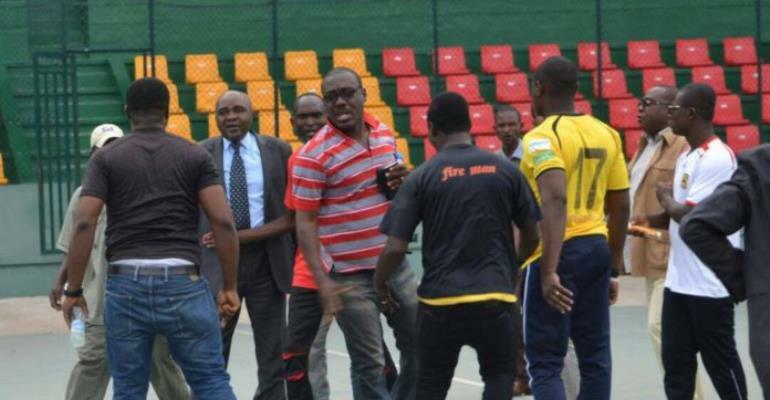 Popular Ghanaian sports journalist Countryman Songo displayed true bravado on Tuesday in Congo as he led a small group of Ghanaian contingent led to stand against the intimidation and oppression by supporters of CARA Brazzaville. The controversial journalist led the team from Ghana including journalist and fans to angrily stand against the unethical behaviour of the CARA fans who intimidated the Kotoko team. According to reports fans have threatened not to allow journalists from Ghana provide coverage of the game and the contingent from the West African country has officially petitioned CAF against the behaviour of the Congolese. Songo is popularly known in Ghana for taking on the system and using his syndicated radio and television show to ‘fire’ corrupt officials in sports. Kotoko are seeking progress to the next stage on the back of a narrow 1-0 aggregate lead from the first leg. In the first leg of the tie which took place at the Baba Yara Stadium in Kumasi, Kotoko were award four penalties in regulation time but they managed to squander three and score one. CARA were also awarded a penalty in the game but they also missed it. The game kicks off at 15:30GMT.